We’ve all boarded that flight and waited patiently as the flight attendants go through standard safety protocol. What I find interesting is listening and watching as the flight attendants on my favorite airline recite this information. For some, you can tell it’s just part of the job, and they deliver the safety information with a lackluster attitude. This might be because it’s the fourth time that day they’ve said it. Or, maybe it’s become so rote that the idea of putting any more energy into it just doesn’t make sense. How do you listen to that safety message? Do you listen to that safety message? 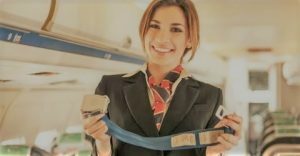 I so enjoy when flight attendants choose to have some fun with the safety message – finding ways to capture your attention, therefore, engaging you in the process. How do you hear that information? The seasonal hiring period is starting and it’s time for local teens to start looking for the perfect summer job. What comes to mind for you when you think about hiring a teenager? Is it a time of excitement, knowing that you get to train and guide a young person within the role for which you’re hiring them for? Maybe instead, it’s a time of trepidation and frustration; you’re wondering how you’re going to find the time to train and guide a novice individual. Does your lackluster enthusiasm for the process reveal itself? Maybe, instead, you find a way to capture their attention and engage those new hires. Let’s be honest, the success you’re looking for and they’re hoping to deliver is going to be reflective of the time and energy you provide your teen staff. As you consider your approach, I want to offer three ideas that can help support you and your young staff. They will also help ensure that the time you devote to them is meaningful and has the impact you want. The intent of their role needs to be clear. An intention is an aim or plan – giving your young staff a clear understanding of the plan for their job goes beyond the job description. Be clear about how you want them to behave in the role. For many teens, this may be their first job, and it may be the first time that someone has taken the time to provide them with the necessary guidance for success. You know what it takes in the job, and you know the expectations of the organization, your department and your customers. Find a way to impart this knowledge to a younger staff member and let them know what to aim for. Seasonal part-time, full time or permanent part-time – it doesn’t matter – have your younger staff identify their goals based on the job description and the intentions that you’ve shared. Sure, this will require additional time to discuss their goals and confirm that they align with your expectations, but these goals should drive them toward success and support their efforts. They can use these goals as their own measuring standard of how they are doing, and you can do the same. Encourage your younger staff to do their own self-analysis. If your younger staff isn’t stepping up when you need them to, ask “why?” Accountability is as much about holding up the mirror as the reflection itself. This is when the SWOT (Strengths – Weakness – Opportunities – Threats) analysis can be helpful. When a younger member of your team can identify their strengths, find ways to boost them. Weaknesses can be difficult for anyone to admit, especially if it’s seen as a fault. Instead, helping teenage staff to understand that weaknesses can provide a real learning opportunity and that you will support them in the process, they can be turned around. Younger staff should also be able to identify what opportunities they are looking for in the job, whether that be advancement or other training experiences. Most often, however, it’s the threats that prevent a young person from stepping up and taking charge. Those threats are usually a perception that a teen has about a situation or expectation. Taking the time to hear their concerns and give suggestions on how to move past any perceived threat reduces fear and empowers a teen to take the lead when needed. So, how are you going to support your young staff? With lackluster energy, or in a way that captures their attention? Using these three ideas are just the start – you can create a positive experience that just might result in the teen employee you had hoped for and the job that will help shape their future. Wishing you a very successful, seasonal hiring experience!